Chris Lenhardt (left), and Howard Lander with their poster at the AGU fall meeting. As researchers in the Earth and geosciences incorporate more data from sensors and other sources into their work, RENCI’s expertise in cyberinfrastructure to manage data throughout its lifecycle takes on more importance in this community. As a result, RENCI was well represented at the AGU meeting in several poster sessions held throughout the week. 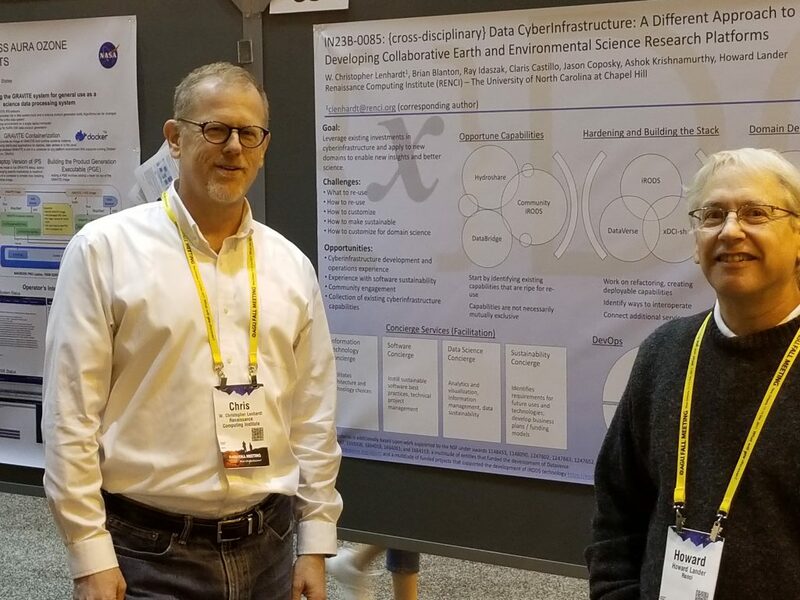 Chris Lenhardt, a data scientist in the Earth Data Science Group, and Howard Lander, senior research software developer, presented a poster on RENCI’s Cross-Disciplinary Data Cyberinfrastructure (xDCI) as part of a conference session on Earth and space science cyberinfrastructures. xDCI is a complete and customizable solution for scientific communities looking to use data cyberinfrastructure to kick start their research and accelerate the discovery process. It merges successful data cyberinfrastructure development efforts so that research teams can build customized, complex infrastructure that enables discovery. Lenhardt was lead author of the poster and co-authors included Lander, Brian Blanton, director of Earth and data science initiatives; Ray Idaszak, director of RENCI DevOps; Claris Castillo, senior computational and networked systems researcher; Jason Coposky, executive director of the iRODS Consortium; and Ashok Krishnamurthy, RENCI’s deputy director. Agile data curation and management, with Lenhardt as a co-author. Flood inundation modeling using high-resolution LIDAR data, with Lenhardt, Blanton, and Lisa Stillwell, senior research software developer, among the co-authors. Building cyberinfrastructure to understand and mitigate the impacts of natural disasters, using 2017’s Hurricane Maria as a test case, with Idaszak and Lenhardt among the co-authors. Lenhardt and Lander also participate in the AGU’s Earth and Space Sciences Informatics Focus Group, which addresses issues related to data management and analysis, modeling, and hardware and software needs to support Earth and space science. For more on the AGU Fall Meeting, visit the meeting website.